There are many different subgrid models of star formation and feedback in the astrophysical literature, and we have included several of them in Enzo. There are also methods that include routines for black hole, sink, and Pop III stellar tracer formation. Here we give the details of each implementation and the parameters that control them. For relevant parameters please also see Star Formation and Feedback Parameters. Select this method by setting StarParticleCreation = 1. The dynamical time is less than the cooling time or the temperature is less than 11,000 K. The minimum dynamical time considered is given by the parameter StarMakerMinimumDynamicalTime in units of years. The cell is Jeans unstable. The star particle mass is greater than StarMakerMinimumMass, which is in units of solar masses. The cell does not have finer refinement underneath it. of stars are formed, where M0 and t0 are the initial star particle mass and creation time, respectively. Mej = Mform * StarMassEjectionFraction of gas are returned to the grid and removed from the particle. Mej * vparticle of momentum are added to the cell. Mform * c2 * StarEnergyToThermalFeedback of energy is deposited into the cell. Mform * ((1 - Zstar) * StarMetalYield + StarMassEjectionFraction * Zstar) of metals are added to the cell, where Zstar is the star particle metallicity. This formulation accounts for gas recycling back into the stars. Select this method by setting StarParticleCreation = 2. Stochastic star formation: Keeps a global sum of “unfulfilled” star formation that were not previously formed because the star particle masses were under StarMakerMinimumMass. When this running sum exceeds the minimum mass, it forms a star particle. Initial star particle velocities are zero instead of the gas velocity as in Method 1. Support for multiple metal fields. Select this method by setting StarParticleCreation = 4. This method is based on the Kratsov (2003, ApJL 590, 1) paper that forms star particles that result in a global Schmidt law. This generally occurs when the gas consumption time depends on the local dynamical time. A star particle is created if a cell has an overdensity greater than StarMakerOverDensityThreshold. The fraction of gas that is deposited into the star particle is dt/StarMakerMinimumDynamicalTime up to a maximum of 90% of the gas mass. Here the dynamical time is in units of years. Stellar feedback is accomplished in the same way as Method 1 (Cen & Ostriker) but Mform = StarMakerEjectionFraction * (star particle mass). Select this method by setting StarParticleCreation = 8. The H2 fraction exceeds the parameter PopIIIH2CriticalFraction. This is necessary because the cooling and collapse is dependent on molecular hydrogen and local radiative feedback in the Lyman-Werner bands may prevent this collapse. If the simulation tracks metal species, the gas metallicity in an absolute fraction must be below PopIIIMetalCriticalFraction. Stellar radiative feedback is handled by the Radiative Transfer module. By default, only hydrogen ionizing radiation is considered. To include helium ionizing radiation, set PopIIIHeliumIonization to 1. Supernova feedback through thermal energy injection is done by the Star Particle Class. The explosion energy is computed from the stellar mass and is deposited in a sphere with radius PopIIISupernovaRadius in units of pc. To track metal enrichment, turn on the parameter PopIIISupernovaUseColour. Select this method by setting StarParticleCreation = 16. A couple of variations on this method exist but are not being actively maintained. They require a completely different set of parameters to turn on such as BigStarFormation; see Grid_StarParticleHandler.C and Star Formation and Feedback Parameters. Select this method by setting StarParticleCreation = 32. The cell must have a minimum temperature of 10,000 K if the 6-species chemistry model (MultiSpecies == 1) is used and 1,000 K if the 9-species chemistry model is used. The metallicity must be above a critical metallicity (PopIIIMetalCriticalFraction) in absolute fraction. When the simulation is Jeans resolved, the stellar mass is instantaneously created and returns its luminosity for 20 Myr. In the case when it’s Jeans unresolved, the stellar mass follows the Cen & Ostriker prescription. Select this method by setting StarParticleCreation = 128. This method relaxes the following criteria from the original Cen & Ostriker prescription. See Kim et al. (2011, ApJ 738, 54) for more details. It can be used to represent single molecular clouds. No Stochastic star formation prescription that is implemented in Method 1. If there is a massive black hole particle in the same cell, the star particle will not be created. The StarMakerOverDensity is in units of particles/cm3 and not in overdensity like the other methods. Select this method by setting StarParticleCreation = 256. The cell is the most-refined cell at that point in space. The density of the cell is above a threshold. The cell of gas is in the region of refinement. For unigrid, or AMR-everywhere simulations, this corresponds to the whole volume. But for zoom-in simulations, this prevents star particles from forming in areas that are not being simulated at high resolution. Cell star formation timescale (Eqn 21 from Springel & Hernquist). and are inputs to the model, and are the star formation time scale and density scaling value, respectively. Note that is not the same as the critical density for star formation listed above. is the gas density of the cell. Mass fraction in cold clouds, (see Eqns. 16 and 18). is a dimensionless quantity calculated as part of the formulation; is the energy released from supernovae back into the gas (note that whether or not the energy is actually returned to the gas depends on if StarFormationFeedback is turned on or not); is the fraction of stars that go supernova soon after formation; is the energy released from a nominal supernova and is set to 4e48 ergs; and finally is the cooling rate of the cell of gas. Finally, a star particle of mass is created with probability (see Eqn. 39). For a cell, the quantity is calculated (below) and compared to a random number drawn evenly from [0, 1). If , a star is created. is a parameter of the model and is the minimum and only star mass allowed; is the mass of gas in the cell; is the size of the simulation time step that is operative for the cell (which changes over AMR levels, of course). If this star formula is used with AMR, some caution is required. Primarily, the AMR refinement can not be too aggressive. Values of OverDensityThreshold below 8 are not recommended. This is because if refinement is more aggressive than 8 (i.e. smaller), the most-refined cells, where star formation should happen, can have less mass than a root-grid cell, and for a deep AMR hierarchy the most refined cells can have mass below . Put another way, with aggressive refinement the densest cells where stars should form may be prevented from forming stars simply because their total mass is too low. Keeping OverDensityThreshold at 8 or above ensures that refined cells have at least a mass similar to a root-grid cell. Another reason for concern is in AMR, changes with AMR level. Adding a level of AMR generally halves the value of , which affects the probability of making a star. In a similar way, a small value of CourantSafetyFactor can also negatively affect the function of this star formula. Select this method by setting StarParticleCreation = 512. This simply insert a MBH particle based on the information given by an external file (MBHInsertLocationFilename). See Massive Black Hole Particle Formation in Star Formation and Feedback Parameters. Select this method by setting StarParticleCreation = 1024. Select this method by setting StarParticleCreation = 2048.
is the ratio of the dust cross section per H nucleus to 1000 Angstroem radiation normalized to 10-21 cm2 ( ) to the rate coefficient for H2 formation on dust grains normalized to the Milky Way value of 10-16.5 cm3 s-1 ( ). Both are linearly proportional to the dust-to-gas ratio and hence the ratio is likely independent of metallicity. Although its value is probably close to unity in nature (see discussion in KMT09), Krumholz & Gnedin (2011) argue that in simulations with spatial resolution of ~50 pc, the value of should be increased by a factor of ~30 in order to account for the subgrid clumping of the gas. The value of this ratio can be controlled with the parameter H2StarMakerSigmaOverR. is the H2 dissociating radiation field in units of the typical value in the Milky Way (7.5x10-4 cm3 s-1, Draine 1978). At the moment only a spatially uniform and time-independent radiation field is supported, and its strength is controlled by the parameter H2StarMakerH2DissociationFlux_MW. is the gas phase metallicity normalized to the solar neighborhood, which is assumed to be equal to solar metallicity: Z’ = Z/0.02. is the column density of the gas on the scale of a giant atomic-molecular cloud complexes, so ~50-100 pc. This column density is calculated on the MaximumRefinementLevel grid cells, and it implies that this star formation method can only safely be used in simulations with sub-100pc resolution. If H2StarMakerUseSobolev is set, the column density is calculated through a Sobolev-like approximation, , otherwise it’s simply , which introduces an undesirable explicit resolution dependence. where is the ratio of the typical CNM density to the minimum density at which CNM can exist in pressure balance with WNM. Currently is hard-coded to the value of 3. It is possible to impose an H2 floor in cold gas, which might be applicable for some low density situations in which the KMT09 equilibrium assumption may not hold. The parameter H2StarMakerH2FloorInColdGas can be used to enforce such a floor for all cells that have temperature less than H2StarMakerColdGasTemperature. This has not been extensively tested, so caveat emptor. Optionally, a proper number density threshold (H2StarMakerNumberDensityThreshold) and/or an H2 fraction threshold (H2StarMakerMinimumH2FractionForStarFormation) is applied, below which no star formation occurs. Typically this method is used with StarFormationOncePerRootGridTimeStep, in which case SF occurs only at the beginning of the root grid step and only for grids on MaximumRefinementLevel, but with a star particle mass that is proportial to the root grid time step (as opposed to the much smaller time step of the maximally refined grid). This results in fewer and more massive star particles, which improves computational efficiency. Even so, it may be desirable to enforce a lower limit to the star particle mass in some cases. This can be done with the parameter H2StarMakerMinimumMass, below which star particles are not created. However, with H2StarMakerStochastic, if the stellar mass is less than H2StarMakerMinimumMass, then a star particle of mass equal to H2StarMakerMinimumMass is formed stochastically with a probability of (stellar mass)/H2StarMakerMinimumMass. Important Note: There is no feedback scheme corresponding to this star maker, so don’t set StarParticleFeedback = 2048. Instead the user should select one of the feedback schemes associated with the other star makers (StarParticleFeedback = 4 comes to mind). Select this method by setting StarParticleCreation = 16384 and StarParticleFeedback = 16384. This method combines stochastic Cen & Ostriker star formation (method 1) with a method for injecting both kinetic and thermal feedback energy into the grid. The star formation method is identical to method 1, which supplements the star formation perscripton of Cen & Ostriker (1992) with a stochastic star formation recipe. Like method 1, there is no Jeans instability check, however, unlike method 1, the particle velocity is set to the gas velocity. The star feedback method is described fully in Simpson et al. (2015) (S15). Feedback energy, mass and metals are injected into a 3x3x3 CIC stencil cloud that is centered on the particle position and mapped onto the physical grid. The outer 26 cells of the cloud stencil impart kinetic energy to the physical grid. The amount of momentum injected into each cell is computed assuming a fixed budget of kinetic energy and the direction of the injected momentum is taken to point radially away from the star particle. This energy is divided between thermal and kinetic energies. This is despite the name of StarEnergyToThermalFeedback, which would indicate that it is just thermal energy. This name was kept for consistency with other star makers. If StarMakerExplosionDelayTime is negative, Mform is computed as it is for star maker methods 0 and 1 as described above. If StarMakerExplosionDelayTime >= 0.0 then Mform is the initial star particle mass. In this case, all energy, mass and metals are injected in a single timestep that is delayed from the formation time of the star particle creation by the value of StarMakerExplosionDelayTime, which is assumed to be in units of Myrs. When the feedback is done in a discrete explosion, the star particle field called dynamical_time is instead used as a binary flag that indicates wheter the particle has done its feedback or not (it is set to 1 pre-explosion and 0 once the explosion has been done). When StarMakerExplosionDelayTime < 0.0, dynamical_time has its usual meaning. If StarFeedbackKineticFraction is between 0.0 and 1.0, fkin = StarFeedbackKineticFraction. If StarFeedbackKineticFraction < 0.0, then fkin is variable and depends on the gas density, metallicity and resolution surrounding the star particle at the time of the injection. Equations (16), (17) and (18) in S15 describe how this variable fraction is computed. The injection of mass and metals is distributed evenly over the CIC stencil cloud and is done in proportion to Mform as described in method 0. The same parameters that control the mass and yield of ejected material are the same (i.e. StarMassEjectionFraction and StarMetalYield). The discrete explosion mode and the variable kinetic energy injection mode are intended for use with low mass star particles which produce energy equivalent to only one or a few supernovae. Sometimes it is convenient to run a simulation for a while until it comes to some sort of equilibrium before turning on star formation. If a simulation is initialized with star formation and feedback turned off, particles in the simulation will not have the necessary particle attribute fields Enzo uses to track data like the formation time, dynamical time, and metallicity. To restart a simulation including star formation or feedback, simply edit the parameter file written to disk in the data dump folder (i.e. for a dataset named DD0100, the parameter file will typically be named DD0100/DD0100. Change the parameters StarParticleCreation or StarParticleFeedback to the values needed for your simulation, and restart the simulation. Enzo will detect that it needs to create particle attribute fields and allocate the necessary memory above what is needed to read in the dataset. The following applies to Methods 0 (Cen & Ostriker) and 1 (+ stochastic star formation). The stellar feedback can be evenly distributed over the neighboring cells if StarFeedbackDistRadius > 0. The cells are within a cube with a side StarFeedbackDistRadius+1. 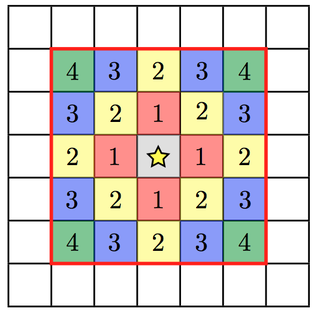 This cube can be cropped to the cells that are StarFeedbackDistCellStep cells away from the center cell, counted only in steps in Cartesian directions. Below we show a couple of two-dimensional examples. The number on the cells indicates the number cell steps each is from the central cell. Only cells with a step number <= StarFeedbackDistCellStep have feedback applied to them. So, StarFeedbackDistCellStep = 1 would result in only the cells marked with a “1” receiving energy. 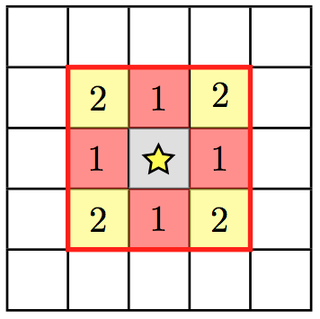 In three-dimensions, the eight corner cells in a 3x3x3 cube would be removed by setting StarFeebackDistCellStep = 2. Same as the figure above but with a radius of 2. Feedback regions cannot extend past the host grid boundaries. 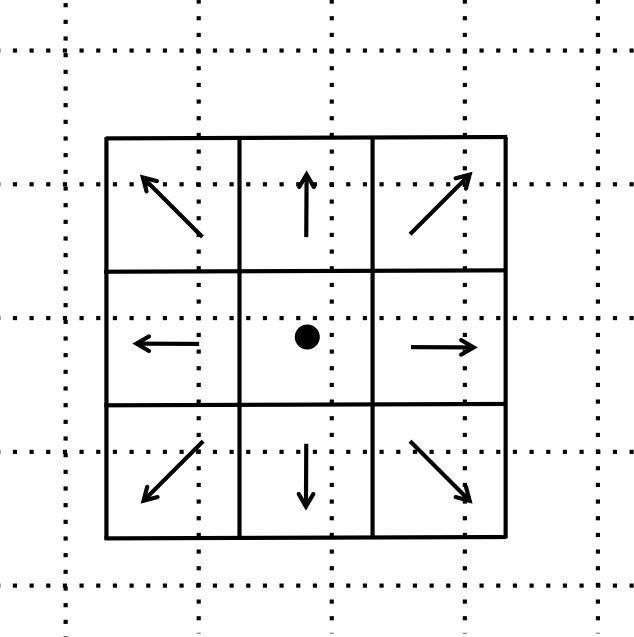 If the region specified will extend beyond the edge of the grid, it is recentered to lie within the grid’s active dimensions. This conserves the energy injected during feedback but results in the feedback sphere no longer being centered on the star particle it originates from. Due to the finite size of each grid, we do not recommend using a StarFeedbackDistRadius of more than a few cells. Also see Star Formation and Feedback Parameters. The routines included in star_maker1.F are obsolete and not compiled into the executable. For a more stable version of the algorithm, use Method 1.